Herb Heilbrun is a local veteran B-17 pilot who served during World War Two. His adventures, and those of his friend and fellow local veteran, the late John Lehr, have been recounted in the book, "Black and White Airmen: Their True History." You can learn more about Herb's remarkable story here. Herb is an honorary member of the Cincinnati Warbirds, and our organization has sought to honor his legacy with a very special United States flag. In the same way Herb fought to keep our flag flying, it is our goal to see that we always keep Herb's own flag flying, by sending it aloft in every aircraft that we can. 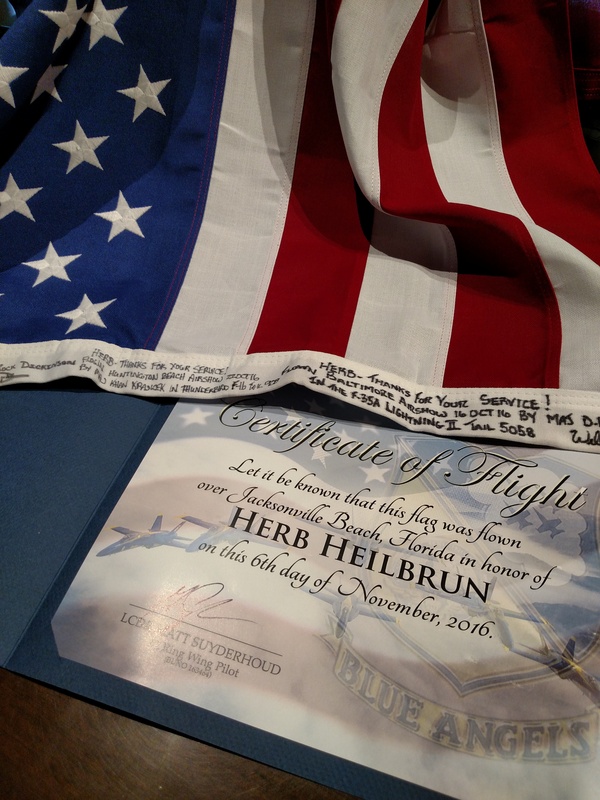 Herb's flag has its own logbook, and it has logged time aloft in some remarkable aircraft...everything from a B-17 Flying Fortress to the F-22 Raptor. If you know of an appropriate opportunity to get Herb's flag into the air, feel free to contact us and let us know. It is, above all, the goal of the Cincinnati Warbirds to 'Keep'em Flying'.